Above: Eurodam at the cruise terminal in Charlottetown. 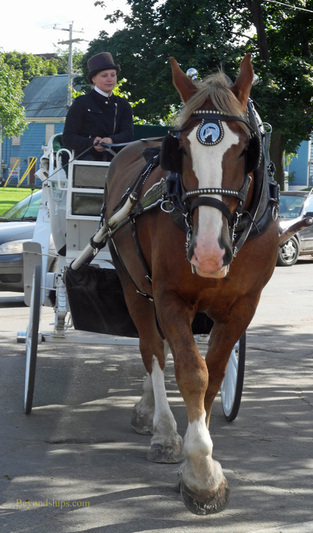 Above: Horse and carriage rides are a popular way to see downtown Charlottetown. 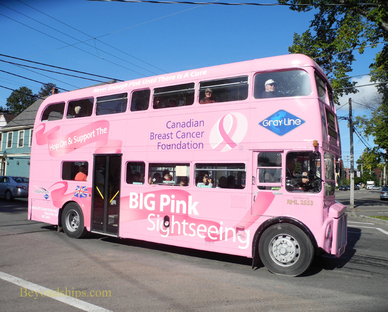 Below: A Big Pink bus giving a tour of Charlottetown. 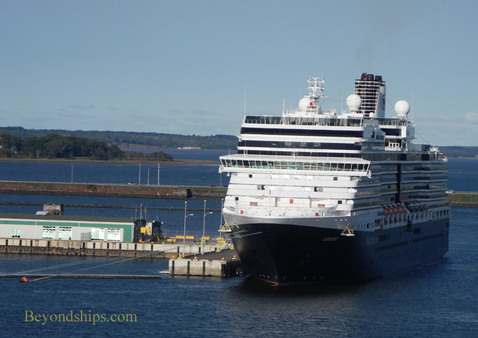 The cruise ship season in Charlottetown lasts from May through October. However, the greatest concentration of visits occurs during the autumn. In 2012, 57 cruise ship visits were scheduled. Charlottetown has a modern cruise ships facility, the Historic Charlottetown Seaport. In 2007, the pier was lengthened and is capable of accommodating a large cruise ship. If there is more than one large ship calling on a given day, the other ships anchor in the harbor and tender passengers to the pier. From the pier, it is only a few steps to the cruise terminal. Inside, there are booths that provide information about Charlottetown and Prince Edward Island. There are also counters selling local crafts and souvenirs. Passengers going on shore excursions often gather inside the terminal. The buses for the excursions can pull up into the parking area that adjoins the terminal. The cruise terminal is a short walk to downtown Charlottetown. Along the way, you will probably pass the locations of various independent tour operators. Above: Brilliance of the Seas tendering off Charlottetown.